Holly Knitlightly: In one day, an experienced tea picker can collect around 70 pounds of tea. That's enough tea to make 14000 cups! In one day, an experienced tea picker can collect around 70 pounds of tea. That's enough tea to make 14000 cups! 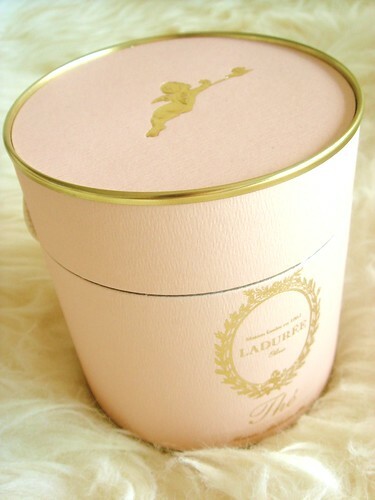 When I was in Paris, I stopped in Laduree. Okay, I stopped there twice... ha! I just so happened to be eating a restaurant a couple of shops away from Laduree. Not only do they have the most delicious desserts ever (and yes, I took photos of what I ate from there! They need to open one up in Ontario, ha. Seriously. The line and price is totally worth it. ), but the tea that they sell is amazing. More specifically, the Marie Antoinette Tea. I'm kind of weird when it comes to having things (well, foods.) that I really like. I try and save it forever, ha. Like these vanilla mints that I picked up in Nice. I ate a box of them in a day or two, and picked up another just before we left. I still haven't opened them. Once they're gone, they're gone! I'll probably never be in Nice again, so I want them to last (although, they're an Italian brand, ha. I just happened to come across them in a shop in Nice.). Same with the Kusmi Tea that I bought in Paris. I haven't opened that up yet, either. (Good news, apparently loose leaf tea can stay for about a year if properly stored and sealed.) Instead I've been drinking all of the Marie Antoinette Tea (that isn't even mine, haha.). Are you like that with things you buy while you're away? AHHH I am SO jealous!!! I would love to go to Laduree!!! You lucky lucky lady!! I'm a tea lady myself, so whenever my friends travel (i'm not so lucky) I make them buy me tea! haha. My sister's friend lives in england and she always brings me home the best english tea. I'm always like that! It drives my husband nuts because I save things for so long, I savour them and try to make them last as long as possible! Pick the healthy tea products containing antioxidants.